It was barely past noon in Tromsø but a murky dusk was already falling. Shivering in the Arctic chill, I retreated to my cabin. A fold-away single bed lined one wall; a sofa that converted into a second single bed sat opposite. There wasn’t much else, not even a TV. But that was just as well because many cabins on the MS Nordlys, though designed for two, are a squeeze even for one. 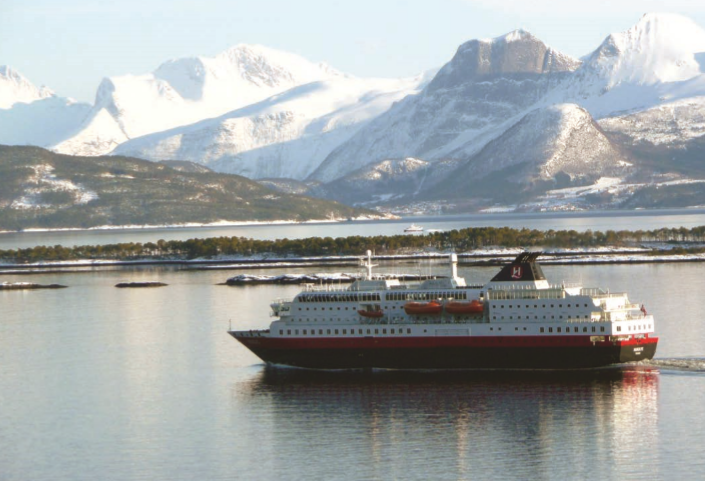 The Hurtigruten vessels that ply the waters of Norway are not, as you’ll have gathered, cruise ships in the usual sense. Though each carries its complement of holidaymakers, eager to experience life inside the Arctic Circle, there’s space for cars and cargo too. The company calls its vessels “working ships” but that undersells them. To many of the remote communities in this beautiful but unforgiving wilderness, they are nothing less than a lifeline. One of my fellow passengers explained that he’d come here in search of a cruise holiday without the gimmicks found on larger ships, perceiving this to be a more natural and authentic experience. I don’t think he went home disappointed. Instead of the culinary cornucopia offered by larger vessels, Nordlys has a single main restaurant, one speciality restaurant, a cafeteria, a bar, and an observation lounge. And that’s it. Breakfast and lunch were buffet meals, while dinner was a set three-course traditional Norwegian menu, occasionally replaced by a third buffet of the day. Entertainment was limited to small social gatherings in the observation lounge, quiet drinks in the bar, or stargazing on the open deck. And that was fine. In fact it was precisely why we were all here. 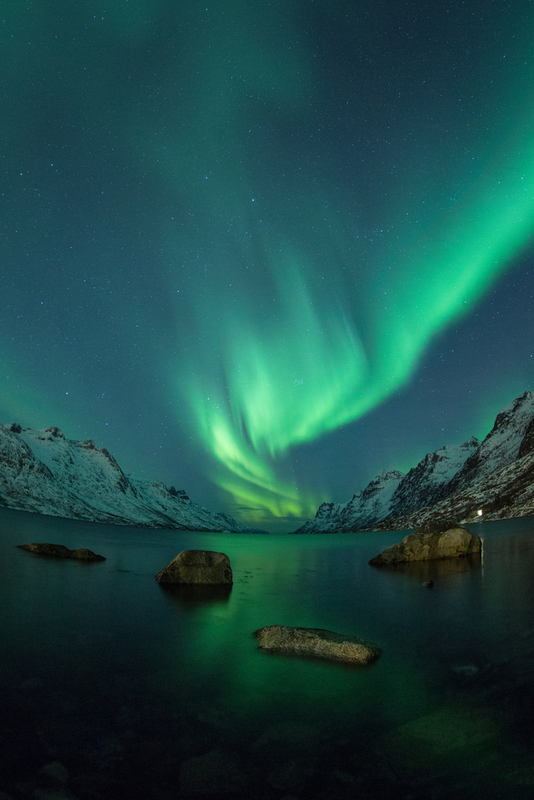 One of the world’s last wildernesses – with the added allure of the Northern Lights – was all the distraction we needed. Nordlys, along with 10 other ships, sails a rigid timetable along the coast between Bergen in southern Norway and Kirkenes at its northern tip. Each vessel makes up to eight port calls per 24-hour period. Most were brief, 15-minute affairs, where the cargo and passenger doors elegantly unfurled just as the mooring ropes were attached. Often a lonesome fork-lift truck would pirouette on the quay side, exchanging local produce for pallets of vital supplies. Occasionally a passenger or two would disembark before the ropes were slackened, the doors gingerly closed and the bow thrusters roared into action. So carefully choreographed, this was a process that never lost its fascination, regardless of how many times I saw it repeated. More generous port calls lasted between one and three hours, just long enough for onshore excursions. Mine took me to the North Cape from Honningsvåg, the northernmost point of mainland Europe; to the Russian border from Kirkenes; and to Hammerfest, claimed to be the world’s most northerly town. Don’t be fooled by the word “excursion”. These trips were far more lively, engaging and informative than the usual cruise-line fare. 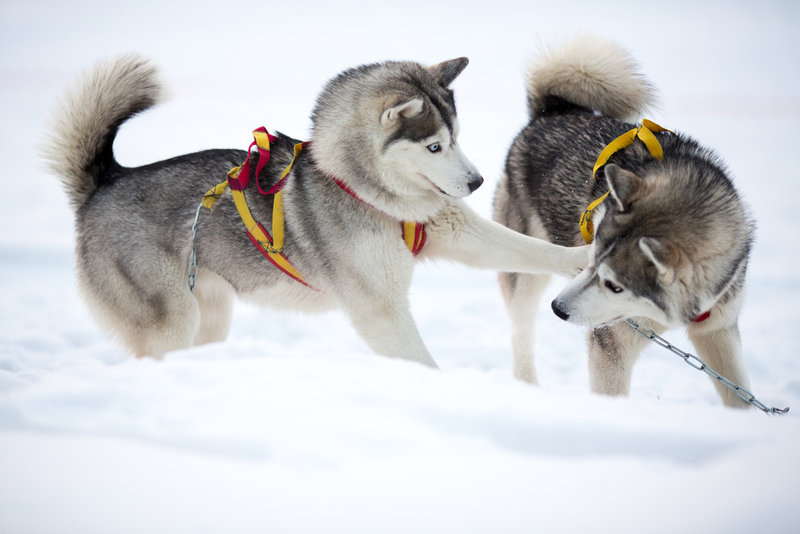 Hurtigruten was trialling its new expedition style enhancements on this voyage, and although we were a couple of weeks early for husky-sledding and snowmobiling, hiking tours led by the on-board expedition team offered a real insight into life among these remote communities. Our guides told tales of hardship and survival from their personal experience, while on-board lectures and storytelling sessions gave them a chance to recount some of the legends of the extreme North. Often they could be found on deck, braving the bitter winds to point out key sights along our way. Hurtigruten even organised a local fisherman to board the ship in the middle of a fjord with his catch of red king crabs, eager to share his knowledge of these spectacular waters. Only straying into open sea where necessary, the ship picked its way through spectacular fjords, lined with snow-capped peaks. This is the kind of scenery you never tire of, but the spectacle I really wanted to see was at night. The Aurora Borealis – the Northern Lights – are as unpredictable as they are spectacular, so I subscribed to the optional wake-up calls when they were sighted from the bridge. That’s how I found myself standing on deck at 4am – an exhilarating if slightly surreal experience – and on three days I was rewarded by faint, hazy displays. On the final evening I braced myself on the wind-lashed deck as Nordlys made her way back to Tromsø, reflecting on how much I had seen and learned. And as I turned to make for the comfort of my cabin, there they were in all their glory: mesmerising, snaking streams of rich green light. It was the best farewell gift that Mother Nature could have offered me. TROMSØ SCENERY AND HUSKIES NOK 495 (approx £40) Visit Tromsø Wilderness Centre on Kvaløya Island to meet more than 250 huskies (and puppies) and learn the rudiments of dog-sledge driving. THE NORTHERNMOST TOWN IN THE WORLD NOK 295 (approx £25) Tour Hammerfest and see the UNESCO listed Meridian Monument, learn about Europe’s first liquid natural gas factory and stop at Mount Salen for a stunning view across the town. THE NORTH CAPE NOK 1140 (approx £95) Explore the wild scenery at Europe’s most northerly point and see a spectacular 180-degree panoramic film. 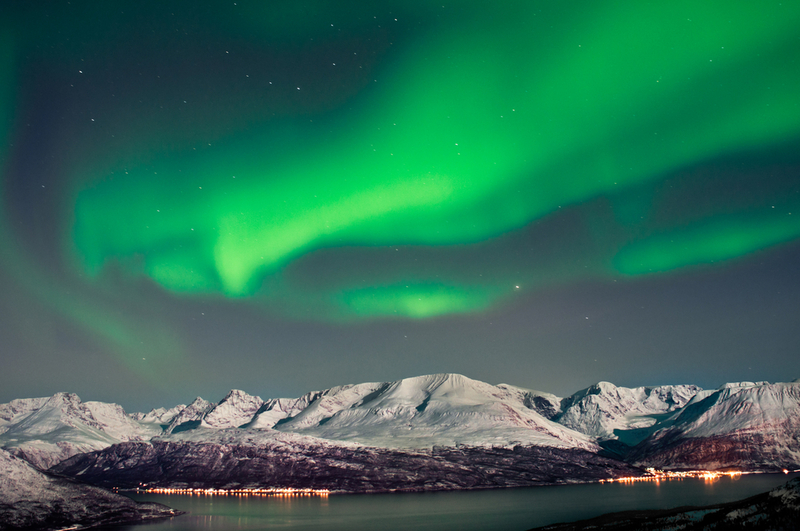 THE RUSSIAN BORDER NOK 495 (approx £40) Tour the town of Kirkenes before heading to Storskog – the border station between Norway and Russia – and Prestfjellet mountain for a breathtaking view.